Leadership change is always the best time to reassess what any country or Government should focus on. Within the next day or so, New Zealand will have a brand new leader with a different set of perspectives and priorities, so here's few suggestions on what the new Cabinet should be targeting. GDP growth for the sake of it seems attractive on the face of it. What's not to love about increasing the total output of the country? There's also a theory, which Prime Minister John Key ascribed to in his resignation press conference, that a strong tide of overall economic growth will help lift everyone's boats. Strong growth certainly helps fill the Government's coffers with GST revenues and income tax revenues. New Zealand's broad-based and low rate tax system is one of the best in the world at ensuring the Government's bottom line does much better when the economy grows. This week's Budget figures showed just how much room that gives to any Government to direct extra funds to the poorest in society and to lift wellbeing through social spending and carefully targeted tax and benefit cuts. But that's not the whole story and it also ignores a fundamental driver in any economy: output per hour worked. This is what a Bill English-led Government should be focused on -- relentlessly changing policies, investing and spending to boost productivity. It's the only thing that matters in the end, and here's why. Increasing output per hour worked increases real hourly wages. It makes an economy properly richer, not just richer on paper or richer because more borrowed money chasing the same number of houses has increased a price. Amidst all the political and tectonic dramas of the last couple of weeks, a small grenade of an academic paper was rolled out into the political and economic debate, and it has yet to explode or at least stun the players in that debate. The Productivity Commission set up by Bill English published an 86-page paper on achieving New Zealand's productivity potential. It is a type of magnum opus that explains why New Zealand's economic performance has lagged so far behind our developed world peers over the last 30 years, and how very little is changing. In fact, it's actually getting worse. Our output per hour worked has stagnated over the last three years and has been slowing down for more than a decade. It has been slowing elsewhere too, but our slowdown has been worse than our key peers, and Australia in particular. The reason our economy grossing faster in gross terms than Australia's and much of the rest of the developed world right now is that we are adding more people to labour force through stunningly-high migration growth, an increased participation rate among older workers and by working more hours per person per week. Essentially, there's just more of us working harder every day. We're not working smarter or working with better machines that allow us to produce more from every hour of work. We're not engaging much more with the rest of the world, which is the key way that most countries spread the joy of productivity growth through their economies. Internationally exposed companies are the best at spreading the best machines and techniques through the economy, and they're most likely to benefit from the economies of scale that comes from connecting into much bigger markets. The major failure of the Key Government and it's much-touted Business Growth Agenda was to increase the export share of the economy. It just hasn't happened. We are employing more baristas and real estate agents, and not nearly enough exporters. The end result is that hourly wage growth has been stagnant in recent years because ultimately real wages are a product of real output per hour worked. A new Government should refocus on increasing that real output per hour worked, and on all the tweaks and reforms needed to grow productivity. The Productivity Commission's paper has plenty of suggestions, including beefing up our competition laws. But much more needs to be done around changing the incentives for investing, improving the skills of both workers and managers, and mostly by making New Zealand more connected to the rest of the world. That's all about focusing on investing in companies that make things and code and services for the rest of the world. It's not about spending more on buying each other's houses, and then borrowing against those inflated values to buy an SUV and go on an overseas holiday. Bill English lamented this export-weak and real estate-driven structure of our economy when in Opposition and in his early years as Finance Minister. His boss, John Key, was less keen on diluting the value of people's homes with real changes, saying home-owning voters actually preferred higher house values. Now is the time for the new boss to step up with a new target that actually changes the engine in the heart of the economy and society, rather than just giving it a new lick of paint and putting on a deck out the back. Immigration will stymie any potential benefits unless they pay attention to it right away. There is little hope of progress unless that one factor is recognised and acted on. The attitude to immigration of Stephen Joyce will not help. I pointed this out on another thread but I think it belongs here too. If you analyze how NZ earns export dollars it all comes down to primary industries and tourism. This activity does not need many workers. If NZ had kept its population at around two million we would all be twice as rich as we are now. 2 million people earning 48 billion export dollars compared to 4.5 million people earning 70 billion dollars. We will never be major manufacturers however primary products are largely inflation proof and are always needed. We could develop our primary industries and fiercely protect our environment and resources to make even more money. Along time ago for a 2 million population. Even so the primary industry as you say should be fails safe. When NZ was about say 3 million how the freezing/meat industry performed. Labour intensive, all the students who funded themselves at peak season plus pretty cheap & plentiful meat for the family table. In those days the product was unadulterated commodity on a simple and cost effective journey to a ready and given market ie the UK. In principle the same strategy could work with China problem is though with the much reduced size of the industry and the introduction of hugely improved regulations and quality control, the economies of scale in terms of profitability, have contracted severely. The world needs to eat safe and quality protein.You cannot eat IT anymore than you can eat machinery. The Clark government touted that they were going to make NZ the IT equivalent of Ireland. Totally misguided. That effort should have gone into primary industry innovation and efficiencies. Hopefully this government may be different. You are absolutely right. I look at our economy like a business and one of the major products are our exports. As you say these are principally tourism, primary products and products derived from these. It doesn't take anything like the workforce that we have to produce these. You could say the staff employed with import replacement contribute similarly but we seem to have cut the guts out of that over the years. So you would have to say that a large part of our work force and population are just overheads that we would be better off without. And if you were running the place like a business you would get rid of them. We certainly do not need to be pumping the country full of immigrants as this is just adding too the costs that our core exporters have to support. It is just crazy. as crazy as the ponzie scheme that it is. The way forward, as with any business, is to strongly focus on raising the productivity of the population that we have and directing it to high value products that world wants. I find it absolutely incredible that John Key claims that we do not have to worry about our productivity!!!!!!! There are whole sectors of our economy that, at the moment are directed to servicing the immigration driven ponzie economy. Housing, construction and creating all the population based services that the extra people need. The buoyancy in these areas are being sold to us as some sort of great economic achievement, which is just so much B.S. as they are just cost that we can do without. Agreed but one of the problems with our productivity is worker attitude & that is a symptom of our times, afraid to say. Once upon a time people worked to save and gain assets, car, house nice clothes etc etc. Now NZ has an appalling savings record per head of population & on the other side of that is the equivalent appalling level of debt. People don't work nearly as hard now simply because they can borrow & borrow easily & the real scary thing about that is that they cannot differentiate between money earned and money borrowed. Have no idea where it's all going to end up. Trouble parts of the primary industry we have in abundance requires hard work, even dangerous if you look at the ACC records of work place accidents. In our circumstances today hard to get the young fit and healthy to bend their backs for hard work! I am all for pushing our value added primary exports like;wine,apples and kiwifruit. However,just adding to our already intensive dairy industry to sell more non-added value whole milk powder to China does worry me. To me,that is not a recipe for long-term economic success and for environmental reasons,I would like to see it shrink. Most of our rivers are significantly environmentally degraded and much of that is down to .farming practices,for which society bears the cost. In economist's terms,these are negative externalities. we need more companies like F&P Healthcare,world leaders in their fields,Zero,Orion and others I could name. We have a vibrant and rapidly growing games industry,which can earn the country billions of $s. Isn't everywhere in the world suffering the same problem of low GDP Growth(per hour worked)? Yeah but we have one of the highest rates of immigration in the OECD. 3x the rate of the UK. That needs to end NOW. Do tell, is that a reason to do nothing - because everyone else has the same problem? We are not including our cultural relaxed attitudes - people come here more for the lifestyle than to work smarter. Maybe, working smarter is less hours, with enough to get by? smoke and mirrors comes to mind, we can pretend our policy settings have us going great, or we can acknowledge the problems it is causing and going to cause and adlust. The Jolly Kid was elected to do a job for another 3 year term until late 2017 ... ... but he chickened out ... what a waste of 8 years , what a total waste of an unprecedented 50 % popular support ... you could've done so much for the country , Key ... instead , you'll walk away with a knighthood for yourself in the new year's honors list, and nothing for us ... a country flooded with low skilled new immigrants keeping wage rates low , and sky-high house prices ... ... what a legacy ! GBH, the outcomes you attribute to Key are witnessed elsewhere. That article just shows Paula Bennet to be a quality family person searching for the greater good in her extended family. No news there except good news. Media should respect family boundaries and not try to create a story. NB: "will help lift everyones boat" is different to saying "will lift everyones boat"
Set a maximum population figure and stick to it. Outfits like the trucking industry would have to lift their game, not race to the bottom with campaigns to bring in cheap immigrant drivers. And whats wrong with truck drivers making decent money ? Lets call it 5Million - people, not cows. Suggest a slight change in focus for us Bernard. Forget GDP as a goal - it is only an acronym. Target should be increasing NZers incomes. You can do stuff with that in your pocket. What about GDP/tonne of carbon? GDP is not the holy grail. What our country needs to focus on decreasing the cost of living.Ironically this could see a drop in GDP. Imagine house prices half what they are and utility prices halved. This is more realistic than doubling productivity which might see those production gains returned to the wealthy anyway. Clean air , clean water , healthy soils and forests : these are the Holy Grail ..
Now, we have "Lake Snot"
It's happening but not widely discussed. Immigration and the environment. Now that the spin master has gone, sort these two issues and you might get me back. You are talking politics here. In politics you never show your true hand unless you have to. Immigration and housing bubbles have turned what should have been the best place for NZers to live, into the best place for migrants to come. 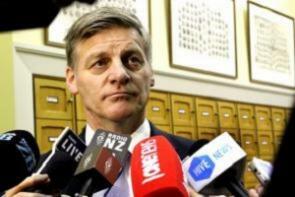 Clark and in Key have done a huge disservice to NZers who were actually NZers 20 years ago! There has been no real per capita growth over their reign. The only way anyone is really better off is because of the out of control property bubble which is now collapsing under the weight of 40% deposit requirements. Great article Bernard spot on. Interest.Co.nz reporter of the year by a mile !!!! Secretive methods such as shell companies were used to buy nearly half of Vancouver’s most expensive properties, according to a new report from Transparency International. If you don’t know who owns a property, that can mean it’s easier for people to launder money or evade taxes, according to NDP housing critic David Eby, who supplied the documents used by the transparency watchdog for this report. Dirty money into property is rampant and is not a new thing. 1/2 trillion of drug money that has to be recycled through the international banking system every year - it can't all be put under mattresses and in to sports cars. "Think of the notorious cases of money laundering before Magnitsky: Citi., Wachovia, HSBC. No one was gaoled. No one senior even lost their job. Fines are a joke. Wachovia, for example handled or laundered over $370 billion of dirty or suspect money out of Mexico. They were fined one two thousandth of that amount, just $160 million. As a percentage of the direct financial benefits accrued to Wachovia, from having the dirty money flowing through their books, fines for money laundering are vanishingly small and better thought of as a tip pressed into the palm of a compliant doorman." I think Billy Boy is going to get a lot of advice from the electorate this next time around. You are concerned about the decrease in GDP per capita. The reasons are obvious the Clark government and the Key Government have put in place a forestry of Bureaucracy and rules and employed an army of unproductive people to police them with no gains but a huge cost burden on the productive economy. End result is that small business dissappears replaced by the inefficient large corporates.